When landing, crosswinds can be very expensive. They cause go-arounds, diversions to other airfields and even crashes. Currently pilots crab in the air to counteract crosswinds and, at the last moment, throw the aircraft around to face directly along the runway. This is a challenging and risky manoeuvre - it can cause asymmetrical stalls and worse. The nose wheel can already be rotated. If the main gear could also rotate, the plane could land in a crabbed attitude and continue that way along the runway until speed had dropped to taxiing speed. How come aircraft don't have this feature? It has been flagged that this question is similar to a previous one, Is the main landing gear of a large airplane designed for sideways (crabbed) touchdowns? My question is different. In those cases the landing gear does not actively turn to face in the direction of travel relative to the ground, it is merely designed to cope with the extra stress of hitting the runway obliquely. The allowed angle may be quite small. A swivelling undercarriage would allow for a large angle of crab with no attendant stress to the gear because the wheels would be aligned with the runway. 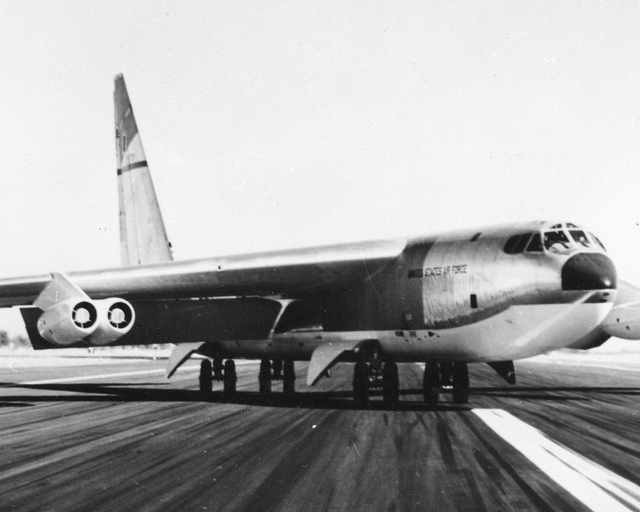 As pointed out on that other question, this design feature was adopted for the B-52. I am asking what factors persuaded designers to abandon this idea. This plane has steerable dual-bicycle gear which allows the crew to point the gear along the runway while the fuselage is "crabbed" up to 20* off the runway centerline. AFAIK the gear are slaved to the ILS; you dial in the OBI to a course and the gear will point that way even if the aircraft points differently. The reason this was done is primarily due to the design of the rest of the aircraft. It's a very "dense" design, cramming a lot of weight into a very small package, requiring massive wings and tail just to keep the thing under control at altitude. These surfaces then become huge sails at lower altitudes, and with the high, anhedraled wing arrangement on a relatively low fueselage, there's not much room for error. B-52 pilots often say you have to fly 2 seconds ahead of the plane, it's that slow to react to pilot input. So, classic "de-crabbing" techniques involving a hard rudder with counter-aileron just aren't going to work with a BUFF. You have to land crabbed and correct after touchdown, and on a dry runway that isn't a good idea either with an aircraft of this size. Modern airliners, for their size, are much easier to maneuver on the whole than the BUFF. Really big ones, like the 747, actually have steerable main gear as well, but AFAIK the 747's mains can only be actively steered on the ground, and because they counter-steer to the nose gear (helps bring the tail around corners; imagine driving something about 4 times longer than an 18-wheeler) they would actually be pointed further off the runway line when de-crabbing. Four- and six-wheel main gear systems used on larger airliners (777, 787, A380) actually have a small amount of castering built in; if you watch YouTubes of crosswind landings (there are several) you'll see that the rear two wheels of each gear touch first and actually twist the entire "truck" into line with the aircraft's actual direction of travel. Then as the plane settles on the gear and the fuselage lines back up with the runway, they'll straighten. Planes with one- and two-wheel main gear don't need this as much (and such a system isn't as effective as the first point of contact of a tire is directly level with the gear strut instead of behind it). I think one aspect one might consider in every refinement one adds is the risk of malfunction. In this case, what's the risk that a swiveling happens when you don't want it to. I suspect that the conventional crabbing procedure might not be so bad once you factor in the additional cost & complexity of a swivel & the risk that the gear swivels when not commanded or swivels not commensurate with the amount needed. My landing gear engineering experience is with jet transport aircraft other than the B-52 or 747, but based on general principals of the discipline here are a few comments related to points which posters have raised. The unusual layout of the B-52 gear -- essentially four main gear nearly in line on the fuselage and no nose gear -- is better suited for a gear-rotating system than the typical tricycle-gear airliner. Designers always have to be concerned with failure modes, and if a failure were to cause just one main gear truck of a tricycle layout to rotate, or either one suffered a hardover failure, the resulting imbalances could be disastrous: A big yaw moment immediately following touchdown; asymmetrical braking forces; lack of braking from one truck if its tires fail; perhaps a resonant strut vibration stressing it beyond its design limit. The list goes on. Payload would be decreased by a least the equivalent of a few passengers. No one in "management" would be good with that, for a system which has no real demonstrated need (see for example the poster's comment "in [12 years], I never had to divert or go-around because of a crosswind"). In my personal experience attending engineering meetings, there's pushback if someone wants to add say a 50 lb item to a 500,000 lb TOW aircraft. Figure that a steerable main gear plus associated systems could easily weigh ten times that, and it becomes a complete non-starter. A big dent in the aircraft's profitability plus introduction of failure modes which could lead to hull loss, all to to solve something which is closer to an annoyance than a real problem. Slight aside: Pre-rotation of main gear tires is in the same "ain't gonna happen" category, for similar reasons (I was the person at my company responsible for sending polite replies to people who contacted us with the suggestion). A lot of weight/complexity, and more failure modes than lay people could imagine, for something which turns out to not really be a problem: all that tire smoke doesn't really amount to much in terms of tread wear... at least not enough to make pre-rotation anywhere close to worth it. Regarding a poster's comment about steerable main gear on the 747 helping with turns during taxi: A related reason why the "inner" (body) main gear trucks on the 747 are steerable is to reduce the stress within those tires caused by something called "scrub". Scrub angle is the difference between which way the aircraft is pointed and which way a particular tire is pointed. That is, at any particular instant a tire will generally not be on the same effective turn radius as the aircraft. The tire "twists" as a result, putting more stress into an already highly-loaded tire (they may not be metal, but tires are as closely designed to loads as any other element of aircraft structure). So even if the aircraft could make a tight turn without the main gear steering, doing so would put an unacceptable load into the tire. Goodyear did produce a crosswind gear system for general aviation aircraft in the 50s. It was a factory option on some Cessna taildraggers and Beech Bonanza tricycle gear aircraft. The axle is spring loaded to rest in a cradle until the airplane touches down in a crab, at which time it pops in the direction of the plane's momentum. Rather weak and finicky brakes gave it a bad reputation, as well as pilots being nervous about touching down in a crab. Boeing 737s apparently have a more modern version in the main gear struts, as they can be observed taxiing while in a crab by aircraft behind them. Not the answer you're looking for? Browse other questions tagged landing landing-gear or ask your own question. How can I calculate the force on the nose gear at landing? What would happen if an aircraft were to touch down on EMAS?